Professor Thomas Cooney, (Dublin Institute of Technology); Angela Hamouda, (Dundalk Institute of Technology); Kristin Schreiber, (EU Commission) and Joan Fahey, (Mayo Ideas Lab). 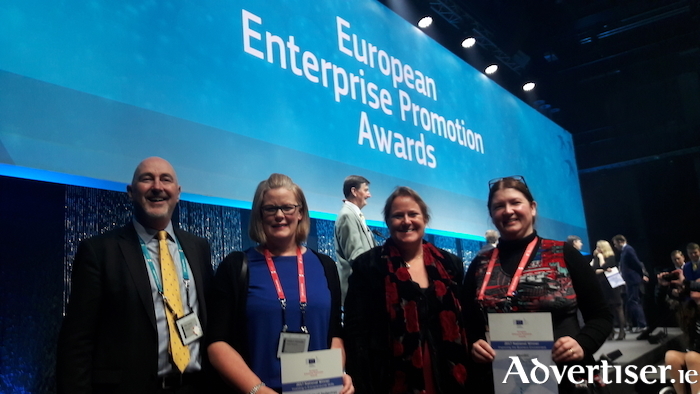 Mayo Ideas Lab received a national award at the recent European Enterprise Promotion Awards 2017 during SME Enterprise Week in Tallinn, Estonia. The European Enterprise Promotion Awards (EEPA ) is an initiative by the European Commission aimed at recognising and rewarding exceptional examples of support and promotion of entrepreneurship across Europe. Companies from all EU countries, as well as Iceland, Serbia, and Turkey can take part in the competition, with some 2,800 projects getting involved since the awards were established in 2006. Mayo Ideas Lab Partners include Mayo Local Enterprise Office, Mayo County Council, Údarás na Gaeltachta, WestBIC, Galway Mayo Institute of Technology, The Innovation Hub at GMIT Mayo Campus, South West Mayo Development Company, Mayo North East LEADER Partnership, Enterprise Ireland and Mayo Education Centre.